Please welcome Elena and her Dachshund Moo to the blog. I introduced her in our 6-year anniversary blog post the other day . Today is her second guest post on the blog. I recently embarked on an outdoor excursion with Moo, two of my friends from work, and their two pups. Our four-legged companions made an unlikely trio: a Dachshund, a St. Bernese Mountain Dog, and a Shih Tzu. We opted for Rattlesnake Ledge in the Snoqualmie area, thinking it would be a good hike for our beginner-level hiking dogs. I was excited to get started on this hike so that I could test out the Hurtta’s Summit Parka (affiliate link) on Moo Jessica gave us. Before moving to Washington, I had an embarrassingly large collection of fashionable little coats and jackets for Moo, but not a single one that was actually designed to keep a dog warm or dry in the outdoors. It’s safe to say that I have retired my cute but otherwise ineffective collection (aside from a few token sweaters), and am now starting from scratch with the good stuff. Upon setting out for Snoqualmie, the day was clear and a balmy 65 degrees, with Mt. Rainier even making an appearance after hiding in the clouds for a few days. I considered not even bringing the jacket but decided, eh, why not? She may get cold towards the top once we slow down. Rattlesnake Ledge is a Washington favorite, due to its close proximity to the big Western Washington cities and the fact that it offers a big bang for your buck. The hike itself isn’t very long at only two miles up, but the view is one that’s hard to beat. I’ve hiked quite a few trails in the Snoqualmie Pass area, but I’ve yet to find one that gives you as great and vast of a view as Rattlesnake does for the relatively short distance needed to get there. Lo and behold, as soon as we parked the car, the sun disappeared and we were welcomed to the trail head with a steady drizzle. I patted myself on the back for bringing the Summit Parka for Moo, and inwardly celebrated the opportunity to put this outdoor jacket to use in all of the elements it was designed to shelter my dog from. For starters, the Summit Parka comes in four colors: Raven, Cherry, Mud and High-Vis Orange (this last color is only available in certain sizes). Moo has the Cherry colored jacket, which looks hot pink in person, and she couldn’t look more adorable in it. The jacket itself is designed to keep a dog’s body temperatures stable in winter weather by protecting the chest and key muscle groups, especially short-haired pups that don’t have quite as much protection. Related: I’m Throwing Out All the Dog Jackets…. Except These! It comes in multiple different sizes, so this jacket can work for almost all dogs. This was a big deal for me, since jackets that cover the entire length of a Dachshund’s body can be hard to come by. Sure enough though, this jacket bundled Moo up from the top of the neck to the base of her booty. The jacket is equipped with pretty much everything you would need to adjust and tighten it to your dog’s individual shape. It has an adjustable back length to make it shorter or (in Moo’s case) longer, as well as an adjustable collar, which offered Moo complete rain coverage up to the base of her ears. It also has a belt that wraps and clips around the waist area, which ensures the jacket is nice, snug and form-fitting. There’s no twisting or turning their way out of this jacket, even if they wanted to. That being said, Moo seemed comfortable in her jacket. It has a warm fuzzy fleece on the inside and waterproof Houndtex coating on the outside (with small 3M reflectors), which kept her warm as we hiked up in the rain. The only issues we had with the jacket were the opening for the harness and the attachment loops that are supposed to go around the back legs, and those were minor. While there is an opening for harness attachment (which, hey, that’s half the battle), it was a little high up on the back for the harness I had on Moo. This caused a bit of harness tugging underneath the jacket. In addition, the harness opening has clasps to close it, which is a great idea to keep your dog dry, but it caused a weird kind of folding and bunching when I attached the leash to the harness buckle. These things were pretty small potatoes though, and by no means deal breakers. I should mention that, due to Moo’s low stature, her stomach, as well as the bottom part of the jacket, did get pretty muddy. This mess is one that I’m sure all Doxie owners out there can relate to. 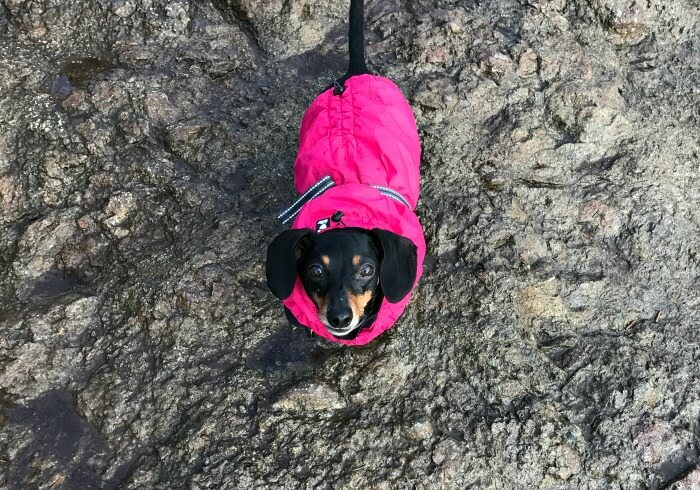 If there’s mud on the ground, Dachshunds will be wearing it, jacket or no jacket. This is no deficiency of the parka, just the nature of putting any article of clothing on a dog breed that hovers only a few inches above the ground. Luckily, the jacket is washing machine friendly, so it was easy to get it clean and ready for Moo’s next adventure. Overall, I really can’t say enough good things about this parka. I would recommend it to anyone who’s looking for a quality outdoor jacket for their dog this winter. It’s really adorable on Moo but, most importantly, She likes it and is comfortable climbing a mountain in it. I applaud Hurtta for this awesome parka design, and look forward to watching Moo climb mountains in comfort and in style. 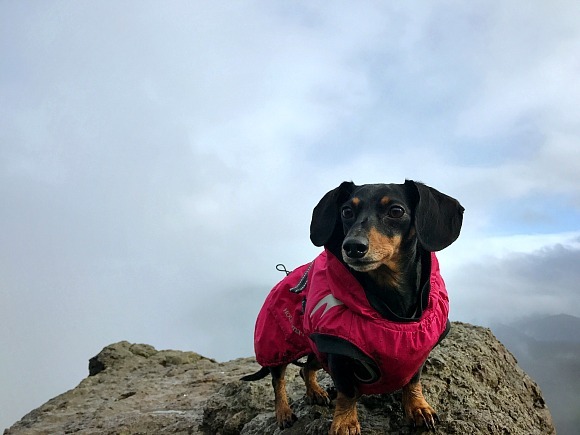 Also check out my article: Best Jackets for Dachshunds! We love the Summit Parka, too! I know every dog is different, but out of curiosity, what size do you have for Moo? I have a mini dachshund who is about 11 pounds and would love to get her a warmer, waterproof jacket than her current jacket for our Indiana winters! Hi Susan. This is Jessica. Moo is wearing a size 12. I’n not sure how much she weighs. Gretel is 11 lbs and almost always wears a 12. Chester is in-between, sometimes wearing a 12 and sometimes a size 14. He is 12.5 lbs. The jackets aren’t sized by weight though so you should definitely measure your pup. You’ll need to know the neck circumference at the base, the circumference of her chest and the length of her back from between the shoulder blades to the base of tail. In my experience, most mini Dachshunds are a 10, 12, or 14. If you want to share your pup’s exact measurements with me, I can help you out. The jacket is adjustable so there is some wiggle room. Thank you very much for the information and the offer to help with sizing! Knowing that she’ll probably be a 10, 12, or 14 and that there is wiggle room with it being adjustable helps. I’ll try to get her to tolerate being measured. Treats will help. 😉 I really enjoy your blog! Forgot to mention the first time I posted that my Mia looks just like Moo! ???? Thanks. And, yeah, treats definitely help. To get an accurate measurement, I usually need someone to hold the treat while I measure. Good luck. Terrific review and that color! Love it. I’ve been looking for a new coat for my Greta as we just moved from Florida to Connecticut, and she’s gotten a bit more stocky with her brand new built in winter coat, so her old coat doesn’t fit her well anymore. 😉 This looks like a really good contender since we are in snow city up here! Thanks for the review, and welcome aboard! Hi Welby. I’m not positive which jacket you are referring to. Do you mean the one from Teckelklub? If so, no, we have not tried it. However, I’ve tried several dog jackets of that style. They are fine for around the city, although it doesn’t cover the chest as we like, but it doesn’t protect from the elements like the Hurtta jackets. When we are out hiking and playing in the snow, we need serious warmth and coverage. It IS nice to see that the Teckelklub waterproof fabric is breathable. That’s not always the case with dog rain jackets. Yes, that’s what I meant! Ok, thanks. I’m in the middle of a decision and looking around for opinions. 🙂 Thanks for your quick reply.